Looked down upon by civil society, treated by politicians as their lapdog, protected by the government like a holy cow, barely recognised by the State, but blessed with astonishing resources, intelligence operations in India are a combination of “tragedy, comedy, ugliness and perfidy”. The Intelligence Bureau (IB)—the eyes and ears of the central government—is over 120 years old. Yet, it was not constituted under any act of Parliament; it has no charter of duties, no framework of policies, no set rules and regulations. Still, it survives and thrives with barely any transparency or accountability. Any effort to reveal its workings invites a sledgehammer blow from the government of the day, using the usual fig leaves of secrecy, national security, confidentiality, etc. In 2004, R.N. Kulkarni, an IB officer of 35 years’ standing, who also served in the Research and Analaysis Wing (R&AW), has put together a book on India’s “secret service”. Titled ‘Sin of National Conscience‘, it throws light on political spying and trickery that has become emblematic of IB core activities. Under the aegis of the Congress, until the advent of coalition governments in the latter part of the 1990s, India suffered from political feudalism. A blurred line divided the activities of the IB and the Congress. The IB acted enthusiastically as a long political arm of the Congress, to further the fortune of the party. It helped the Congress to screeen party candidates to fight elections for the lesiglative assembly, legislative council, Lok Sabha and Rajya Sabha. The Congress, during 1982, wanted to select a candidate to the Rajya Sabha for the category of nominated seats, to fill a vacancy. Generally, the nominated candidate was expected to be an eminent person to represent a wider spectrum of society, free from the obligation of party affiliation, and free to speak on the floor of the House on the merit of the subject. Nevertheless, the Congress was keen to select a candidate in such a manner that he felt obliged to the party and augmented its numerical strength in the Upper House. He should also join hands with the party, if need be, in its political machinations. The IB was given the task of finding out the suitability of one such candidate based in Mysore. 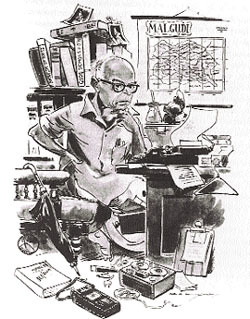 He was none other than R.K. Narayan, a wellknown story writer of great fame. However, Narayan was perceived to be close to officials of the US embassay in India and was observed attending the parties hosted by Americans in Delhi. This made the Congress uncomfortable about his candidature. The IB was roped in to sort out the problem for the Congress and it was directed to conduct a detailed secret enquiry about the candidate to draw his correct and comprehensive political profile. a) In the event of his nomination, whether he would toe the official line of the Congress or not. b) Whether he would abide by the directions of the high command of the Congress. c) Whether USA would be able to influence his political conduct in the Rajya Sabha. d) His intimate views on various important issues in political, economic, defence and foreign affairs. e) Whether he would be amenable in a crunch situation to the party’s manipulations, etc, etc. Even though R.K. Narayan was a great writer, he did not have matching articulation. As a result, the operative working on him found it difficult to draw his profile. So a secret enquiry was further conducted among his friend and relatives to know his political face. This facet of political spying was confronted with an ethical question as to whether the conduct of IB was justifiable. And whether IB should really further the cause of the Congress in the guise of national security. Such unethical working of IB had become the order of the day and inflicted pain on the operatives and the national conscience. What should be the ethical equation of IB in matters of such political spying? Narayan was eventually nominated to the Rajya Sabha where his ardent plea to reduce the weight of school books reverberates to this day. This entry was posted in Issues and Ideas, Kannada & Karnataka, Literati, Mysore-Bangalore and tagged Churumuri, Indira Gandhi, Intelligence Bureau, R.K. Narayan, R.N. Kulkarni, Sans Serif. Bookmark the permalink. *Kritagnya* Publication ಅಂದ್ರೆ, ಕೃತಘ್ನ ?? OK, Thirunaaraayanan did nothing wrong and passed the the test. Three cheers for negative virtues. OK, he said something about our children not having to be mules. I don’t see how it makes him their sole liberator. What do kannadigas have to be grateful to Margayya about? Name one thing he said or did in kannada in public when living in karnataka and before breathing his last in TN. How was he any different from our Jayalalithamma who never acknowledges she is one of ours? URA is no kannadiga in the true sense of the term (for kannada and karnataka), but speaks our tongue. No matter what language one speaks or doesn’t speak, to live in karnataka is to respect us badakannadigas. Raamu Guha is no kannadabandhu just because he lives among us anymore than the thiru who is not with us anymore. When one lives in karnataka, one owes something to our naadu or nudi. Chiranjeev Singh is about the only non-kannada born VIP in recent times to have shown us real respect. I have no knowledge of DGP Singh saying something to our kanishtabilles in kannada although he got his mahaprabandhi (Ph.D) for translating something from Kannada into punjaabi or English. Good to have obliging local subordinates, as did the British. If kannada or kannadigas get no maryaade, it is because we don’t know to expect it. Heck, if I were to script this whole post in Kannada, Churumuri might not even publish it. Obviously, Kulakarni Saheb knows how our version of the CIA will characterise him. This is bound to be a self-published book. How to read the rest of the fairy tale? The man walked for hours in his neighbourhood, receiving and proffering advice and so on? Doesn’t say much for the intelligence of the bureau man, does it? What does another icon R.K.Laxman say about this revelation? Okay R.K. Narayan remained true to his Tamil Iyer roots. Never learnt Kannada although stayed most of his life in Sarwastipuram of Mysore. But his Malgudi is remeniscent of old Mysore more than Chennai or Madurai. Apart from this we should not forget his ‘Emerald Route’ which is a travelouge of Karnataka. My tharale is exactly about the man avoiding Kannada in public. I am sure he knew how to speak it. You know, “The natives don’t count” kind of thing one encounters in many parts of Bengaluru. Good enough to use in unisyllabic words with those who do chores for us. A word about the Kaveri dispute? Some indication that he was interested in our yogakshema? I imagine Col. Wakefield learned to speak Kannada in a Mowgli sort of way. I am sure he used it with his co-workers from non-NGO outfits. I mentioned Chranjeev Singh as a worthy model in my last comment. Let me name Vasundhara Das. In the meantime, I hope whoever put that sorry snippet of Sushma Swaraj pitching for the BJP in a broiling Kannada on You Tube will take it down. Narrow minded, parochial, provincial, un-Indian? So be it. Karnatakadalli kannadave modalu. I am glad that Churumuri helps keep the debate alive, intentionally or otherwise. A correction: RKN lived in Laxmipuram and Yadavagiri. BTW I would say he remained true to his ‘Tamil’ roots. Some of our best literature came from GV Iyer (Kannada Iyer) and TP Kailasm (Tamil Iyer). Not to mention PTN, Masti, Rajarathnam, A. K. Ramanujam, and many others. A correction: That should have been K.V. Iyer! Obviously DB was drunk! PGV your list is very good except for AK Ramanujam who really was not in the same class as others in the list. Thanks!. Oh I have met Mr Kulkarani several times and he talks passionately about the book. And once even advised me to read it but then I dutifully ignored it. Hes a very good friend of my uncle. Will pick up the book nxt time ! !